Lard. 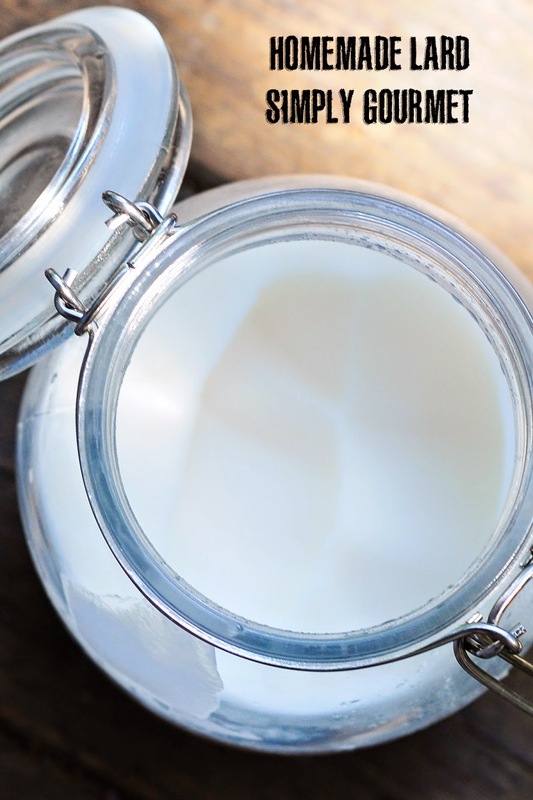 It is what we use in our home when we need a solid fat. I also use grass fed butter or coconut oil. 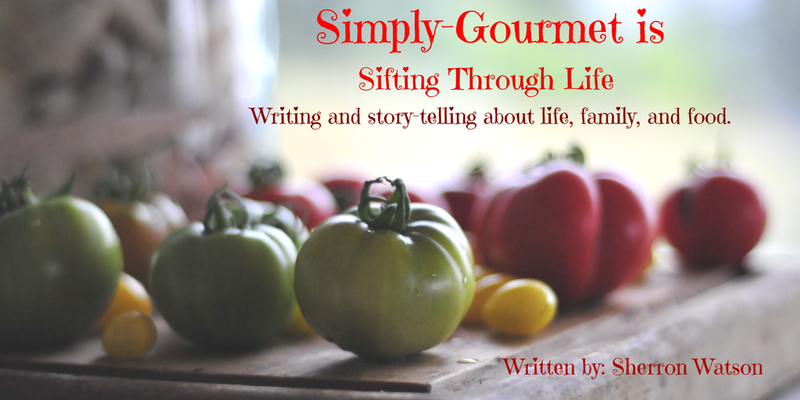 It depends on the recipe and what flavor profile I am trying to achieve. Lard is pretty flavorless when used in baked goods. It makes the best buttermilk biscuits. Really--it does! 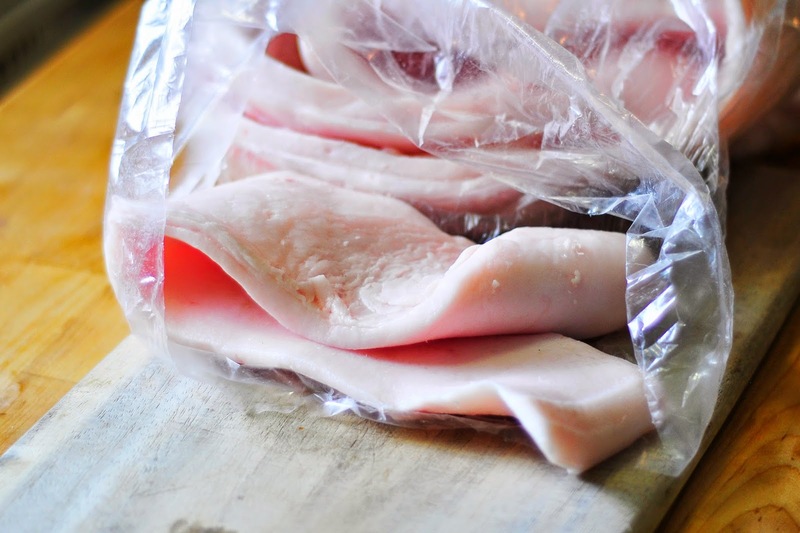 There are two types of pork fat you can use to make the lard: the back fat and the leaf fat. You will need to talk to your local butcher to see which one he access to. I have used both. Leaf fat is sought after because of its prized performance in baked goods and little-to-no flavor. I buy mine through a local catering business that resources local farm produce, dairy and vegetables. He offers a CSA and has been able to get pretty much anything I want--including this pork fat. I am hoping to get some ducks in the Fall to render duck fat. Oh, the fun I will have with that tasty ingredient. Rendering your own lard is not hard. There are several methods that you can use to obtain the lard. I have read that there is a process of using a crock pot and the other is to slow cook it in your stove. I like the method of using a pot on the stove top. I am in the kitchen usually and I do other things while the fat is rendering. This works for me. If you enjoy pork rinds then you will LOVE the cracklings that are left over after all of the fat has been rendered. These little crispy pork tidbits are the perfect snack. You can add them to salads too or make some cornbread with crackling pieces. A few things to be mindful of when making the lard. It will burn if you set your heat too high. I like the slow approach of keeping my heat set to about 4 on my stove and watching it slowly turn into lard. You want the heat high enough to be doing its job but not high enough that you will burn what is in the pot. 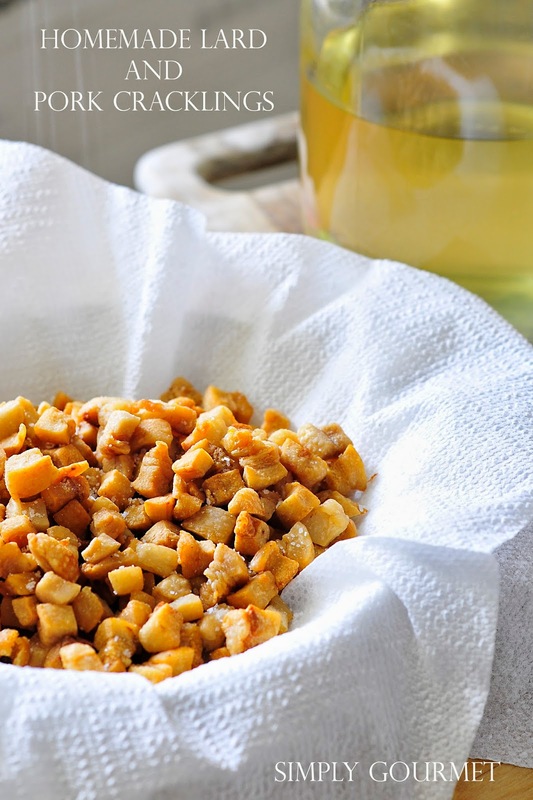 The cracklings are basically cooking in their own fat but if it gets brown or starts to burn it will change the color and the flavor of the lard. My lard comes in strips. I separate the lard into the portions that I want to use to make a batch and freeze the rest. To use, I thaw the lard and follow the directions below. I used a dish cloth with a rubber band to strain my lard. This is my go to system for anything I have to strain. I don't always have cheesecloth around and this works just fine for me. I will remove the lard several times from the pot. I don't let it all sit in the pot. This will allow you to work in small batches and also prevent you from ruining an entire batch if something goes wrong. The lard will be this beautiful yellow when hot and in liquid form. It turns snow white when solid. The lard is very durable. Some say that it does not need to be refrigerated. I won't be telling you that. I do refrigerate mine because I live in a very humid area and I don't want to risk anything spoiling my little pot of liquid gold (even though it would be a solid). It has been recommended to me that in the refrigerator it is good for 3 months and in the freezer for one year. By all means, when in doubt, do your own research. Here is my recipe for the best gluten free biscuits (use this lard): BISCUITS. 1. 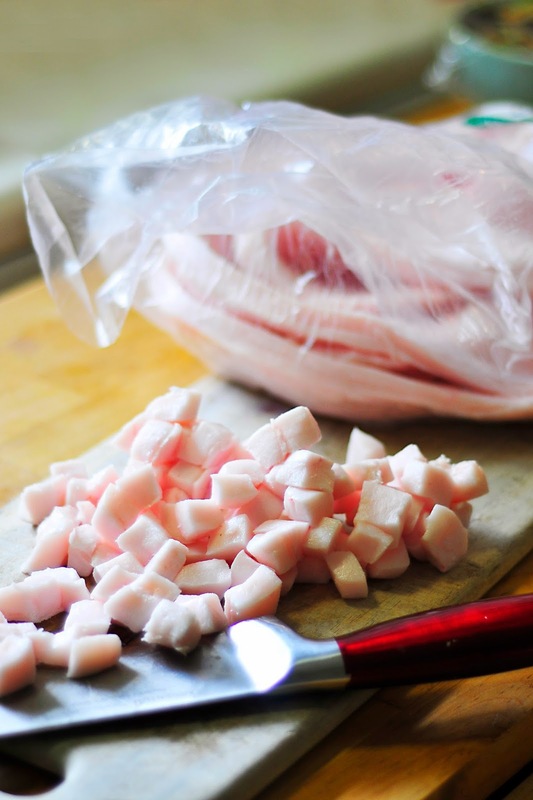 Cut your pork fat strips into small cubes. Mine were about 1/2 inch by 1/2 inch. (see picture above). 2. In a large stock pot add pork fat cubes. Turn heat to medium on your stove top. Mine is electric and I use 4 or 5. Gas would be set at a low to medium flame. 3. Stir pork cubes occasionally to prevent them from sticking to bottom of your pot and to rotate the cubes in the pot. After a few minutes you will start to see a small amount of rendered lard on the bottom. After 30 minutes you should have a few inches. 4. 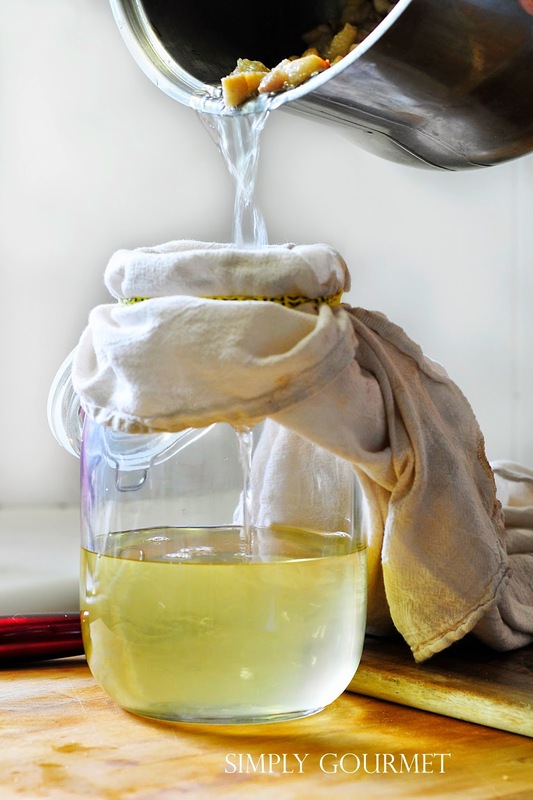 While the fat is rendering, prepare a glass jar with a piece of cheesecloth or thin cloth. See picture above. You will strain the lard often. 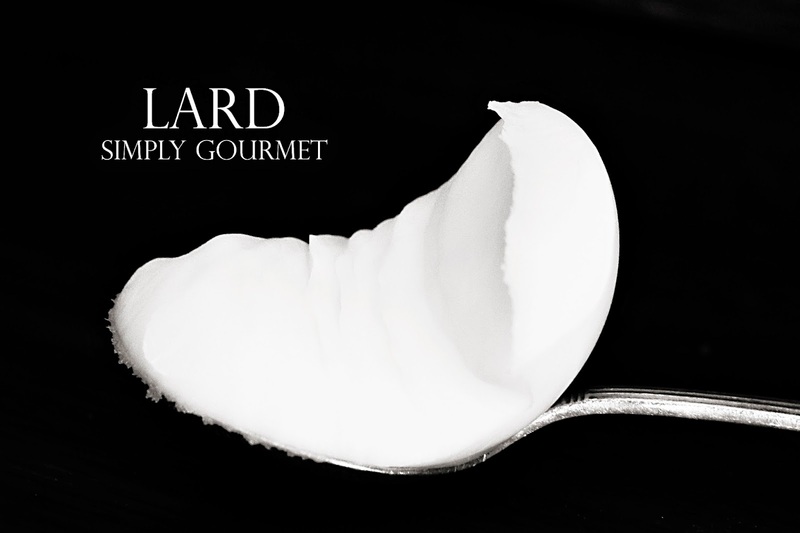 The lard takes anywhere from 1 to 2 hours to render completely. I find the last little bit of time is the hardest because the cracklings are almost done and the fear of burning everything is high. This is why you want to strain the lard off of the cracklings often. 5. Once everything is rendered the lard needs to cool. As it cools the yellow liquid changes to a solid of pure white. Store in the refrigerator.